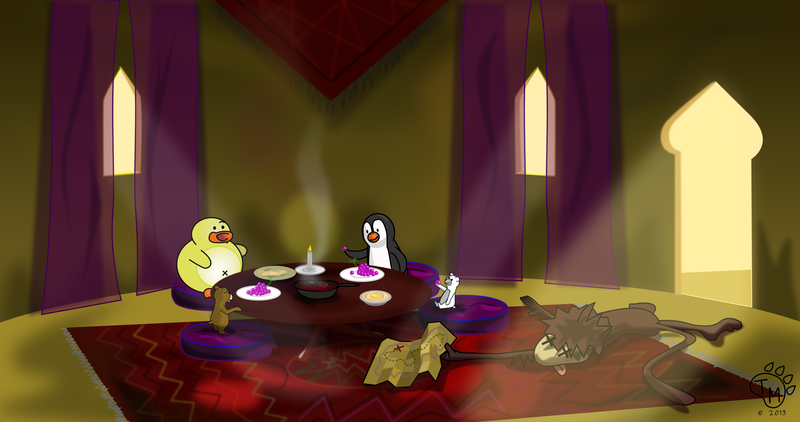 While traveling in the Arabian desert, Ducky and the gang visited a small village, where their favorite restaurant, Ali Baba Ganoush, is located. They ordered a full spread: grapes, hummus, pita, and shakshouka (poached eggs in a tomato stew). They were enjoying themselves, when all of a sudden a disheveled monkey crawled through the door and collapsed. In his hands he gripped a map. “Quick! Get some water!” Pembleton yelled as he came around the table to check on the poor fellow. “Your friends are in danger. You must help them ” the monkey gasped as he handed the map to Pembleton. Blizzard rushed over with a glass of water. Pembleton helped the monkey to a pillow in the corner of the restaurant and urged him to take a few sips, before he fell asleep, exhausted by the journey. “I don’t know, Ducky, but we are going to find out.” Pembleton said as he looked at the map and examined it closer.